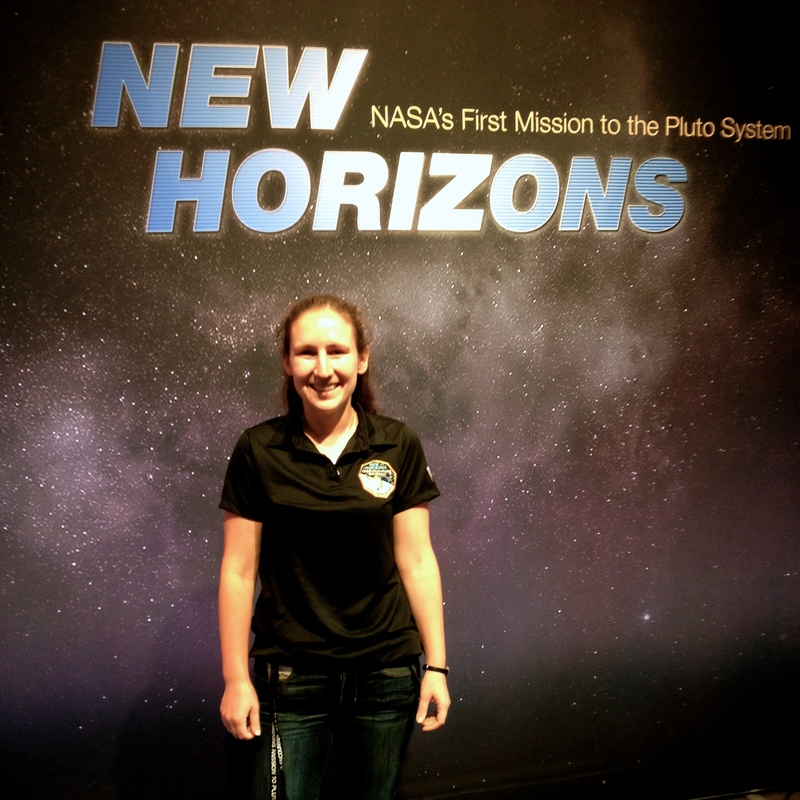 Today’s post is written by one of the early career members of the New Horizons Science Team. Alissa Earle is a graduate student in Planetary Science at the Massachusetts Institute of Technology. Her work focuses on the long-term seasonal variations that may be affecting what we see on Pluto’s surface. Pluto’s diverse surface, typified by the smooth bright plains of Sputnik Planum being adjacent to the dark terrains of Cthulhu, defies any easy explanation for how it got that way. In my work, I am trying to explore how “seasons” on Pluto might be part of the explanation. There are two reasons for Pluto having seasons. The first is for the same reason that Earth has seasons. The second is unique to objects with elongated orbits, like Pluto. 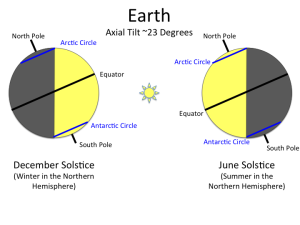 Both Earth and Pluto have seasons because their spin axes are “tipped over.” Earth has a rather modest tilt, only about a 23-degree slant compared with being straight up-and-down in its orbit. The consequence of this tilt is that over the course of one year, the North and South Poles take turns being tipped toward the sun. 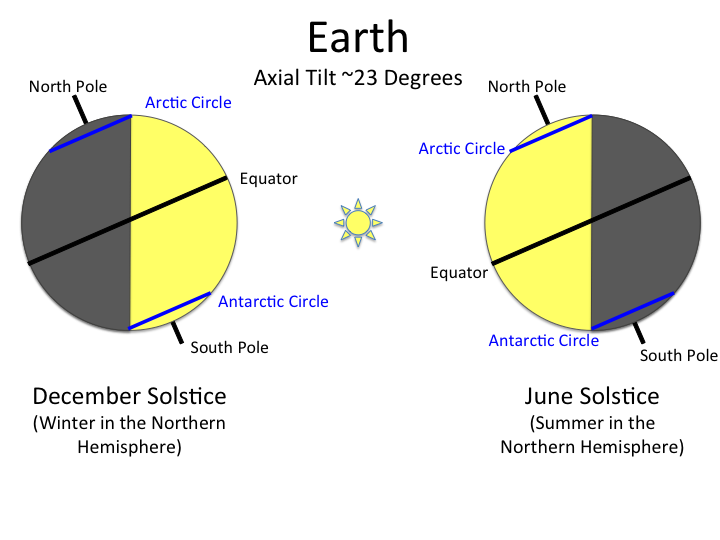 Earth’s North Pole is tipped more toward the sun in June, and six months later with the Earth being on the opposite side of the sun, Earth’s South Pole is tipped more toward the sun in December. This gives us alternate seasons of summer and winter, even though the Earth is in a nearly perfect circular orbit. 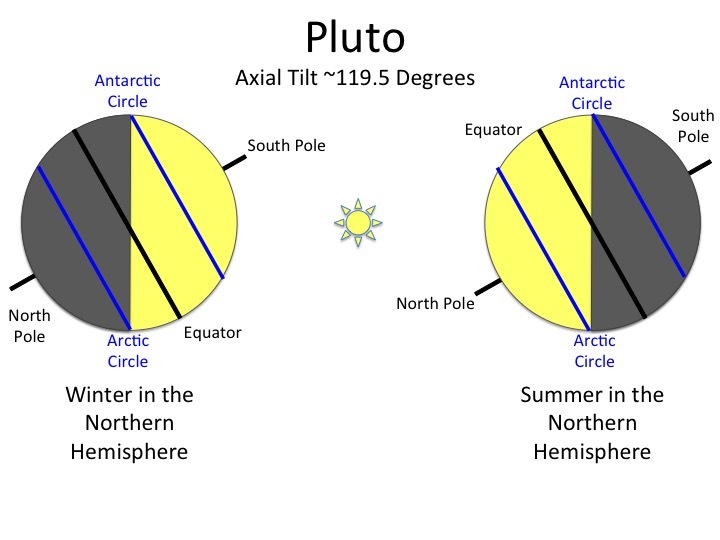 While Earth’s 23-degree axis tilt is mild, Pluto’s axis tilt is extreme: 119.5 degrees! What this means is that Pluto’s north pole is nearly upside down compared with Earth. What’s more, the extreme tilt gives very extreme seasons. On Earth, the midnight sun in summer and arctic darkness in winter are limited to the highest latitudes on Earth (the Arctic Circle at 67 degrees north and Antarctic Circle at 67 degrees south). On Pluto, the midnight sun and long arctic darkness affect nearly the entire planet. The equivalent for Earth would mean all of North America and Europe would experience months of midnight summer sun and then months of darkness in winter. Because Pluto takes 248 Earth years to go around the sun, these long seasons last more than a century. But wait, there’s more. The second factor driving Pluto’s seasons is that its orbit is not circular. Instead, it is very stretched out into an ellipse. (To imagine an ellipse, think of the silhouette of an egg tipped over on its side.) Earth’s orbit is also elliptical, but to a much smaller degree than Pluto’s. During its orbit, Pluto passes as close to the sun as about 30 times the distance between the Earth and the sun (bringing it even closer to the sun than Neptune) and travels as far away as about 50 times the Earth-sun distance. This means during some seasons on Pluto, the effect is even more dramatic: for example, “hotter summers” for whichever part of Pluto is tilted toward the sun at the closest point in its orbit. This effect is not unique to Pluto, although Pluto is one of the most extreme cases of it. For example, Mars experiences a less dramatic version of this effect because it has an orbital tilt a little greater than 25 degrees and moves between 1.4 and 1.7 Earth-sun distances over the course of its orbit. Keep in mind, that on Pluto, “hotter” is a relative term. A summertime high might only be “in the 70’s” as measured in Kelvins—about 330 degrees below zero Fahrenheit (minus 200 degrees Celsius). It’s refreshing to see at least one example that makes our Boston winters seem mild.